But for a few hundred metres the Moari would have made it into Hout Bay. The Moari was a Shaw Saville and Albion liner weighing 5371 tons. On the 5th of August 1909 it sailed out of Table Bay bound for New Zealand. The weather was foul with rain and fog and rough seas as the ship made its way down the Atlantic coastline of the Cape Peninsula. 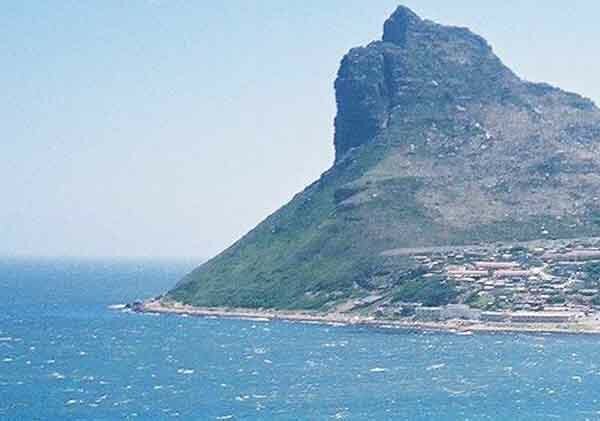 Shortly after midnight the vessel slammed into the rocks at Duiker Point off the coast of the Karbonkelberg near Hout Bay. Just around the corner from Sandy Bay. As she rammed the rocks her hull was split open and twisted around so that the stern ended up facing the land. When she ran aground the master of the ship ordered the lifeboats lowered and the men on board clambered into them for safety. Three boats hit the water and two of these were lost during the storm that night. Some of the men in the third boat managed to get ashore and made their way to a farmhouse belonging to a Mr Bester to raise the alarm. When the news of the ships grounding eventually reached Hout Bay a local fisherman and his son climbed along the treacherous mountain side in the dark till they found the ship. As they could see no life aboard the ship they made a fire on the mountain to keep warm. This must have attracted the attention of the men trapped on the Maori as shortly afterwards the fisherman saw lights on the ship. When he realised the grave danger the people on the ship were in the fisherman immediately sent his son back to Hout Bay to call for help. From his vantage point on the shore he could see the ship was stuck fast on the rocks and huge waves were breaking over her. He also noticed people clinging to the higher decks and to the foremast waiting to be rescued. After many attempts a line was eventually passed to the ship and a safety rope was rigged to the shore. Of the 14 men left on the ship after the lifeboats had gone eleven men were rescued by being pulled ashore on the safety line. One was washed away by a huge wave never to be seen again while attempting the crossing. All in all out of the 53 men on board 32 lost their lives that night. The wreck was eventually washed off the rocks by the waves and sank in 25 metres of water where she still lies today. The Maori lies in an area known as the fridge of the Atlantic as the water is very cold there. All around the ship are kelp beds, of fish and crayfish. The wreck is very well preserved considering its age. When the ship sank it was carrying a cargo of explosives, crockery, glassware, sewing machines musical instruments and water piping. Much of this stuff is lying on the ocean floor near the wreck but may not be touched as it is protected by law. For those who don't mind a bit of kelp, plenty of jellyfish and some large crayfish sitting in the cracks of the rocks eyeing you while you dive, this is a dive you should do. To reach the wreck you need to get a boat ride from Hout Bay. On the way to the wreck site you will pass Seal Island which is worth a visit if you have the time. The coastline along this stretch of the Cape Peninsula during the summer months is well worth a visit as there is some spectacular scenery to be seen. I hope you enjoy your stay when you visit Cape Town to dive on our wrecks.